Lucerne, 28 September 2017 – Gerber is the classic among cheese fondues. First launched back in the 1960s, it is now the most popular fondue in Switzerland. This is no surprise, since it is practical and perfect every time. However, demand for fresh fondue mixes is constantly increasing. 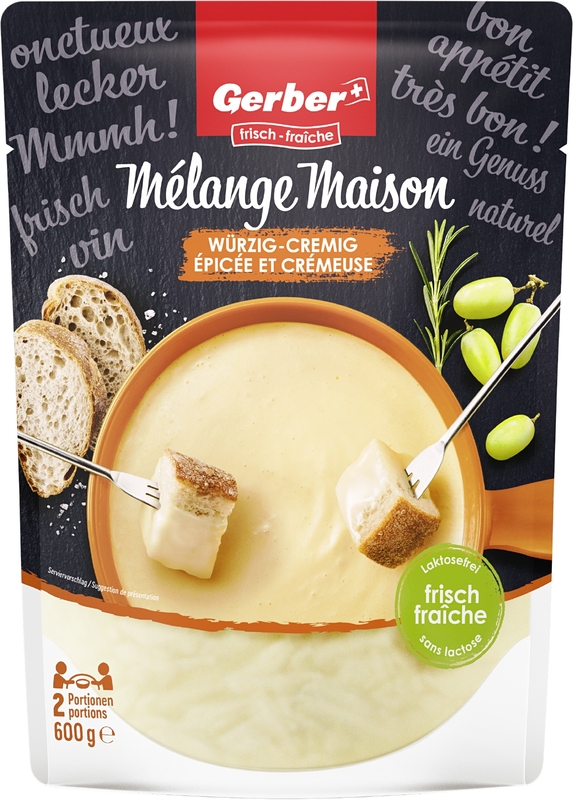 Emmi aims to impress fondue fans with the new Gerber Mélange Maison fresh fondue. High-quality speciality cheeses and Swiss apricot brandy – which is used instead of Kirsch – give the fondue a unique taste. Gerber ready-made fondue is well-established in Swiss food culture. This classic, which was launched back in the 1960s, owes its popularity to having a balanced flavour, its guarantee of perfection every time, its long shelf-life and being easy to store. Classic Gerber Fondue is ideal when a craving for fondue strikes. However, ready-made fondues have been subject to strong competition in recent years. Demand for fresh fondue mixes has been growing increasingly. While freshly grated cheese mixes are somewhat more time consuming to prepare, they undergo minimal preprocessing and contain no emulsifiers, making them a more natural way to enjoy cheese. The Gerber fondue experts at Langnau in Emmental firmly believe that the new Mélange Maison will impress the most-demanding fresh fondue customers. The high-quality cheeses it contains support this aim: alongside tangy Le Gruyère AOP and Scharfer Maxx, Raclette ensures the mix melts perfectly. The apricot brandy in Gerber Mélange Maison gives the fondue a distinctive flavour. This high-quality brandy is made from Swiss apricots by Distillerie Diwisa in Willisau. Besides white wine, spices and starch, no other ingredients are added to the freshly grated cheese. The fondue therefore contains no stabilising agents or preservatives. Unlike the classic Gerber Fondue, the cheese mix is not heated during manufacture, while the fondue experts at Gerber also guarantee a perfect result every time for this product. Gerber Mélange Maison is now available in chiller cabinets at Swiss retailers. The 600 gram pack serves two. Ingredients: Swiss cheese (Raclette, Le Gruyère AOP, Scharfer Maxx) 58 %, white wine, water, starch, apricot brandy, spices. Pioneers Walter Gerber and Fritz Stettler had been trying to extend the shelf life of wheels of cheese for years. In 1911, they succeeded thanks to a special process, thereby founding the Swiss processed cheese industry. This processed cheese has been available in the well-known round boxes since 1921. The highly successful, multiple award-winning Gerber processed cheese triangles were joined by GALA, a still unique fresh cheese made from double cream, in 1936. GALA is sold in semi-circular boxes and also became famous quickly throughout Switzerland. Gerber L’Original ready-made fondue was launched in 1960, at a time when convenience foods were still almost unheard of in Europe. As the future would show, this was a wise decision, as the product became an important mainstay. Gerberkäse AG was acquired by Emmi in 2004, and merged with two other long-standing processed cheese manufacturers, Tiger Käse AG and Zingg AG, to create the leading company in the Swiss processed cheese industry at Langnau in Emmental.